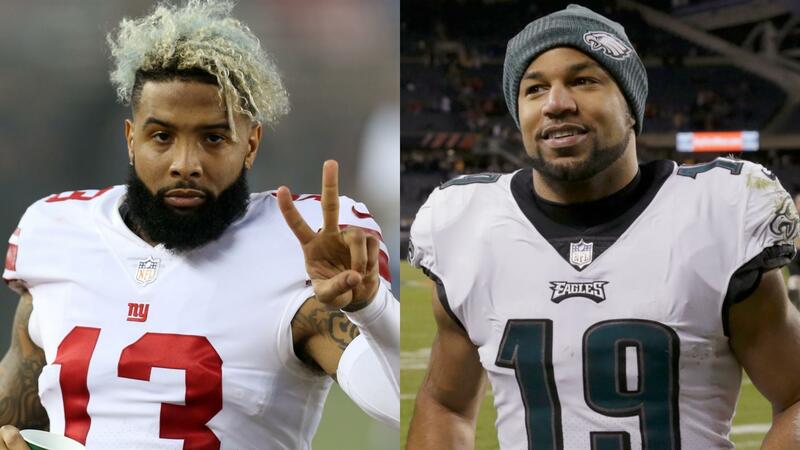 The New York Giants agreed to a deal with Golden Tate on Thursday, as the team tries to fill the void created when wide receiver Odell Beckham Jr. was traded. Tate's agents at CAA Football announced the deal but did not provide terms. It's a four-year, $37.5 million contract that includes $23 million fully guaranteed, a source told ESPN's Adam Schefter. The Giants traded Beckham to the Cleveland Browns on Wednesday in a blockbuster deal that shook the league. Looking for an offensive jolt, the Philadelphia Eagles acquired Tate from the Detroit Lions at the trade deadline in late October for a third-round pick. He had to learn a new system on the fly, and the team struggled to integrate the veteran receiver. The trade paid dividends in the postseason, though, as Tate caught the game-deciding touchdown for a wild-card win against the Chicago Bears. Tate, 30, plays mostly in the slot at this point in his career, and the Eagles are due to pay Nelson Agholor, another slot receiver, more than $9 million in 2019. With limited funds and needs in other areas, it didn't make much sense for the Eagles to double down on the inside. Tate finished with 74 catches for 795 yards and four touchdowns in 15 games with the Lions and Eagles last season, and he also contributed on special teams as a punt returner. He had 90-plus catches in each of his previous four seasons with Detroit, surpassing 1,000 yards three times. The second-round draft choice (60th overall) by the Seattle Seahawks out of Notre Dame in 2010, Tate has 611 receptions for 7,214 yards and 38 touchdowns in his nine-year NFL career. In other free agent news, the Giants have an agreement in place on a one-year deal with outside linebacker Markus Golden, sources told ESPN's Jordan Raanan. He played under defensive coordinator James Bettcher in Arizona and had 12.5 sacks in 2016. He's looking to prove himself in his second season back from a torn ACL. The 27-year-old was selected by the Cardinals in the second round (58th overall) of the 2015 draft. In his career, he has 19 sacks, 123 tackles and has forced six fumbles, recovering one.